The raw foods diet is more than a diet, it is a lifestyle. It comprises more than how we eat, it affects how we live, how we work, how we spend our time, energy, resources, and money. With a raw foods lifestyle, first you must rearrange the most important room in your house and that is your kitchen. Many people think that adopting a raw foods lifestyles by eating raw is sooooooo expensive, and it can be but it doesn’t have to be for many reasons. One thing for sure is that the more you eat raw, the less you eat because remember you are eating organic living foods which means you are supplying your body with more nutritional power than you would on a cooked diet. You are supplying your body with live enzymes and food that contains an abundance of nutrition so your body doesn’t feel as hungry as it normally would by eating food devoid of its vital nutrients and vitamins. Setting up a raw foods kitchen is simple, easy, and fairly inexpensive, and easy to maintain. You don't have to go out and buy all of this equipment at once. That would be expensive. As you grow and learn how to make food, you might want to purchase more equipment as you go along. Some of you may already have some equipment, so dust off any kitchen equipment that you haven't used in a while. It may go a long way with your new raw foods lifestyle. Make whole food juice that's full of fiber and flavor in under a minute.Cook soup from scratch that's hot, hearty and satisfying in just 4 minutes.Make frozen treats that are full of fruit and low in fat in only 30 seconds.Grind fresh whole grains into flour and knead dough for healthy home made bread in one 5-minute operation. Start your 30-day no-risk in-home trial today and we'll give you FREE Standard Ground Shipping! 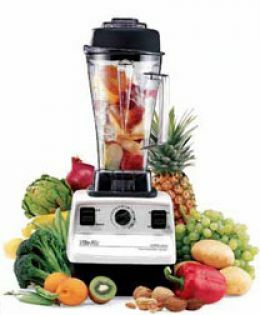 The Vitamix Blender is a valuable piece of equipment for the raw foods lifestyle. It can make raw foods soups, cheeses, spreads, smoothies, etc for your new raw foods diet. It can even grind grains and make the healthiest raw ice cream EVER! There are two different types of Vitamix Blenders that you can choose from. Why not use any other blender? You can opt to purchase other types of blenders, but the Vitamix blender is much more durable, sturdier, and dependable than most other blenders. Watch The Vitamix at work! A dehydrator is a wonderful addition to your raw foods diet and lifestyle because it allows you to create more gourmet and elaborate dishes for yourself and your family or to entertain guests. Juicers are used to make amazing vegetable juices. They extract the fibers from the juice. There are many different types of juicers to choose from according to how much you are juicing. Juicers are either centrifugal, masticating, and/or triturating. There are also citrus juicers, wheatgrass juicers, and multi-purpose juicers. Check out my article on how best to pick out a juicer. A good knife set and a knife sharpener is essential to a raw foods diet because all you ever do on a raw foods diet is slice, dice, chop, slice, dice, and chop some more. There’s nothing like cutting yourself on a dull knife. It’s the worst kind of cut ever! Visit our store online for the best raw foods chef knives available! Mesh bags or nylon nut bags or cheesecloth are used to make nut milks. You can make milks from sunflower seeds, almonds, brazil nuts, cashews, and macadamia nuts makes for a sweet milk. You can purchase out book "The Goddess of Raw Foods" for nut and seed milk recipes. A saladacco is used to make pastas from zucchini, beets, and other types of squashes for a raw foods diet. It makes cute little shapes with food and can be used to garnish dishes for those advanced gourmet raw foods chefs. *Always throw out food after three days. It loses its nutritional punch and it will spoil after the third day. *Use eco-cleaning products to clean equipment, cutting boards, and counter space. Or simply use lemon water and vinegar. *Add plants to your raw foods kitchen. It is important when starting to eat more raw foods, to keep your costs of eating less. I understand that most people think that eating this way is more expensive when in fact, it doesn’t have to be that way. It all depends on your tastes. -	Buy in bulk-	Buy wholesale. Go to your State Board of Equalization in your State and apply for a wholesale license. Most wholesale licenses are FREE!